Teresa Gaye Hitch was born in Hamilton, Ontario, Canada, and now lives on Canada's spectacular and inspiring westcoast. For her, painting is a contemplative journey of deep inner joy, wonder and discovery. Driven by a spiritual exploration of beauty found in our natural world, Teresa is fascinated by the continuously changing landscapes of coastal British Columbia, especially of the ocean. Her multi-layered paintings are often described as “jewels,” possibly because of the importance of reflection, light and space in her work. Spanning over almost four decades, Teresa’s professional art practice has ranged from photo-realism to abstract. She has worked in materials as diverse as metal (sculpture) and raku (ceramics). Collage and assemblage have been passions since childhood, when she would retrieve discarded objects, and then recreate them into precious artworks. 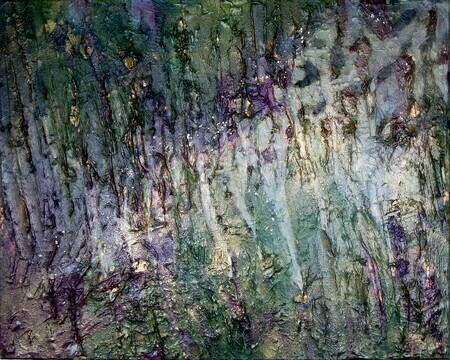 Her present paintings (mixed media and acrylic) reflect and integrate this dedication. Teresa’s educational highlights include an MFA (Otis Art Institute, primarily with Betye Saar and Charles White), BA (Occidental College, primarily with George Baker), and a BEd (Brock University). She has also studied art at The Banff School of Fine Arts (Banff, Alberta with Ilse Lubane), and Instituto Allende (San Miguel de Allende, Mexico). Teresa extends much gratitude to many others, including to Robert Genn. Teresa’s work has been exhibited internationally, and is in collections throughout the world. When visiting Teresa's galleries, please click on your favourite individual paintings to read writings/poetry for richer and more meaningful viewing experiences.